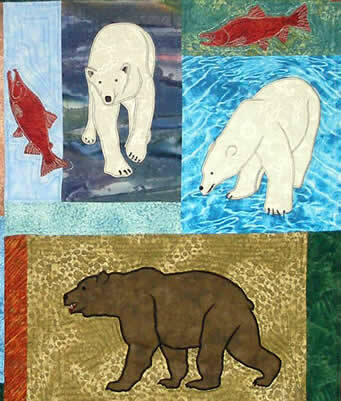 People have been asking for a separate pattern for Bears for forever. I never could figure out how to do them, until now. 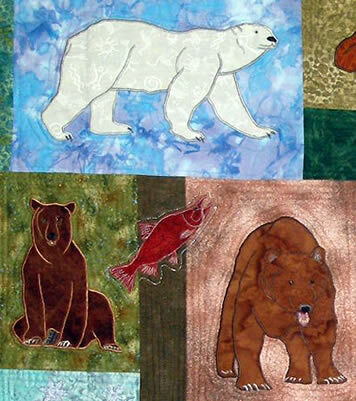 Drawing of 10 bears, five polar bears and five other bears: grizzlies, brown bears, sun bear, and one sockeye salmon. 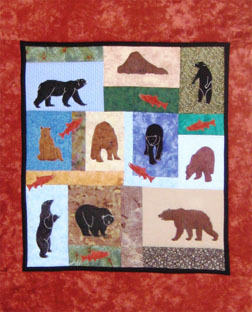 This pattern includes instructions for raw edge and satin stitch appliqué techniques using a fusible such as Steam-A-Seam lite, and an easy way to do pieced 3" Bear's Paw cornerstones with half square triangles. If I can do matching triangles, it really can't be hard! I specialize in appliqué because my triangles in pieced blocks never came out the same. I used a 1/4" foot for accuracy of all the cornerstone parts. I sewed on the binding from the front to back because of the cornerstones. Normally, I stitch the binding from the back and sew a decorative stitch on the folded edge in front. I included a new diagram for making mitered corners on the binding, too. The quilt in this photo is 35" x 35". 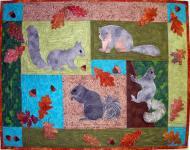 This quilt was made by Nancy Hicks. 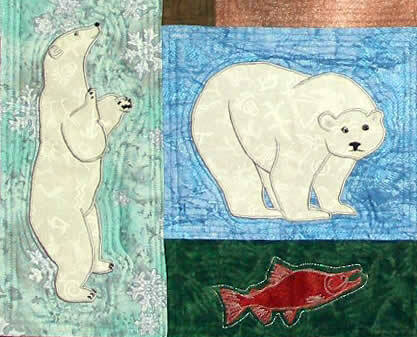 These are detail shots of the quilt above made by Debora Konchinsky.